Features & Benefits - Tradesmen's Software, Inc.
Cut take-off time in half. Do your take-off once, and do it right the first time. You’ll have a bottom-line bid price that includes materials, labor dollars and equipment. Plus, you get an accurate and detailed report of the estimated quantity of materials. There’s no need for a second take-off to order your materials and supplies. • Accurate. 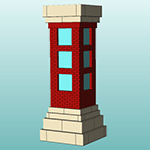 If you takeoff a modular brick pier, backed up with 8″ CMU that is 2′-0″ x 2′-0″ x 8′-0″, you have exactly 360 mod brick and 24 8″ CMU. This pier take-off takes 10 seconds or less. Make any size pier in seconds and have exact quantities. • Detailed. They say a picture is worth a thousand words — our picture is worth thousands of time-saving dollars to the mason contractor. The 3D Estimator can automatically figure all of these pieces into a detailed piece count — no need to go back and spend time calculating the piece count after you are awarded a project. 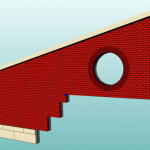 Enter a wall banding with its elevation, and Tradesmen’s OS3DE knows what materials to add and deduct for any openings, control joints, jambs or corners. This alone will justify your investment in Tradesmen’s OS3DE. • Fast. Our Assembly System allows you to select any wall or opening from an existing project assembly and bring it into your new project. 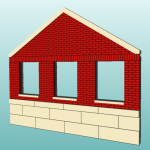 Modify the wall or opening height and add different material items that might be required for the new take-off. Our Copy Last feature eliminates repetitious entering of information by allowing you to copy and modify assemblies you just built. As you increase the size of your database, you’ll see your time savings grow exponentially. see the actual wall section as you build it (below, left). 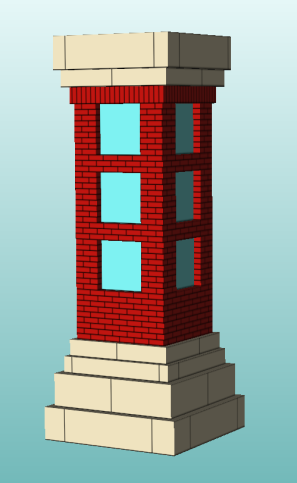 see the building as you do your take-off, displayed in perspective, outside, inside, or plan mode. zoom in, walk through and see your work at any elevation. figure special wall shapes, such as piers, gables, slopes and steps (below, right). 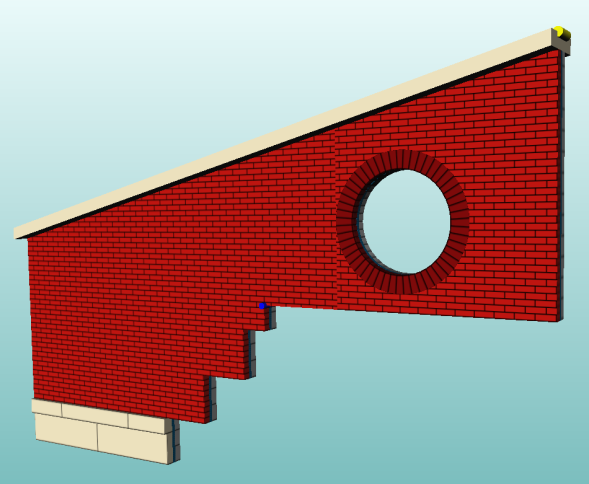 Take advantage of BIM modeling capabilities. So what is “BIM”? Business Information Modeling (BIM) is a digital representation of physical and functional characteristics of a facility. With BIM you’ll get a shared knowledge resource about a facility to form a reliable basis for decision making during its life-cycle — defined as existing from earliest conception to demolition. For today’s mason contractor there is a growing expectation to produce a BIM model as part of a bid agreement. Many do not have the ability to create a model in-house, and instead are forced to invest thousands in enlisting an outside consultant. Tradesmen’s Software, Inc., is currently offering a BIM conversion service for customers enrolled in the annual technical support program. Simply email your 3D project created with Tradesmen’s OS3DE to support@tradesmens.com and we’ll send you an IFC (Industry Foundation Class) file. 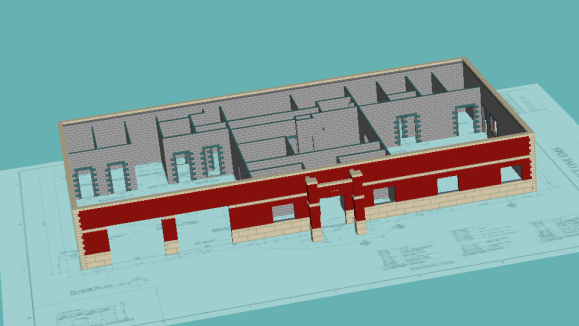 This model of your 3D masonry take-off can be incorporated into most BIM projects, again saving you time and money. Step-up the professionalism of your presentation. You’ll gain instant credibility just by presentation alone. When the customer inevitably asks about changes to the design, you can instantly show them the cost difference for those changes and show them what it would look like. Things like bandings, pilasters, different bonding, different color material, different color mortar, arched openings, limestone jambs, circular openings, panels… that’s the OS3DE difference. Improve communication from the office to the field. 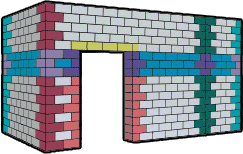 Your mason foreman will see what an area or building is going to look like before they even lay the first brick. 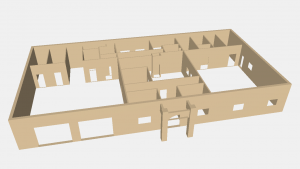 Your foreman can also use Tradesmen’s On-Screen 3D Viewer license for a walk-through of the virtual building, giving them a feel for the project, improving their efficiency. With your foreman using an OS3DV license you’ll save time & money with seamless communication between the field and office. Go paperless and lower your costs. How much money does your company spend on purchasing or printing out paper plans every month? 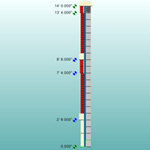 Go green by importing digital floor plans directly into Tradesmen’s OS3DE and doing your take-off on-screen. It’s easier and cheaper for you, and Mother Nature will thank you as well. Increase productivity and morale in your estimating department. We hear it all the time: “Don’t tell my boss, but I’m actually having fun using this!” Estimating doesn’t have to be a repetitive grind. Attract and keep qualified professional estimators by giving them a forward-thinking tool that will increase their productivity, eliminate mistakes, and actually bring some fun to the job. Designed by a mason contractor for the mason contractor. The software is intuitive to learn for someone with estimating experience and general computer knowledge/skills. The hands-on audio walk-through makes it easy to get started. The estimating program comes with over 400 material items in the database. You don’t have to take the time to enter any information before you can get started learning the program. You will use our labor rates, crews, lay rates, mortar yields, etc., to go through the walk-through. Your basic information is added after completing the walk-through. Tradesmen’s Software provides a toll-free number (800-494-6922) to use if our new or existing customers have any questions or need assistance with the project they are working on. You can also schedule one-on-one conference time with linked computers.